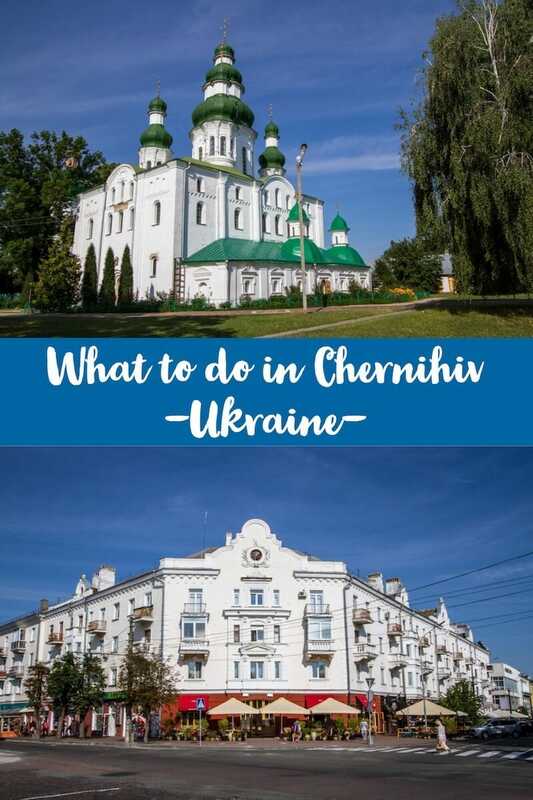 Part of our series of posts on travel to the eastern part of Ukraine, this part focuses predominately on our time in the city of Chernihiv and also touches on what to see in nearby Slavutych. 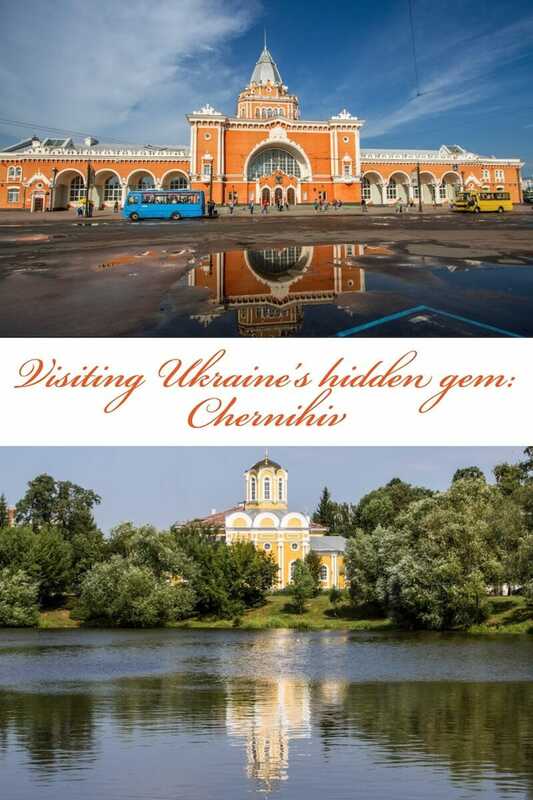 I’m surprised more people don’t visit Chernihiv. 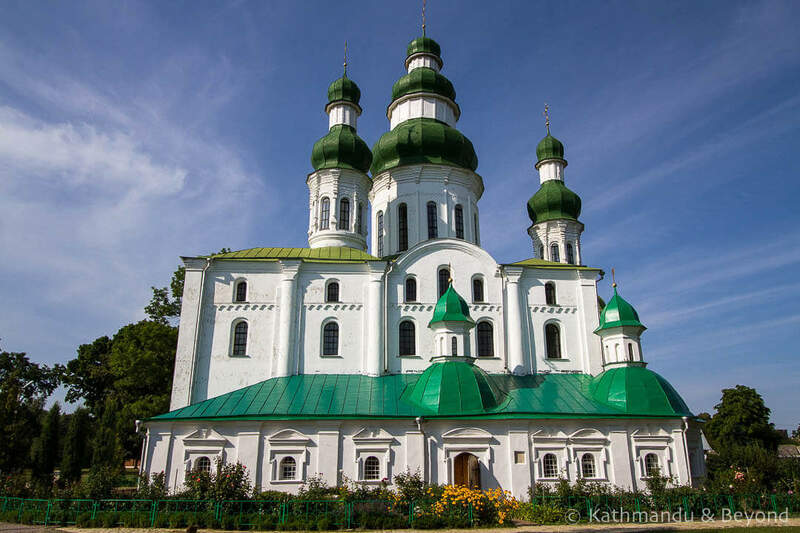 It’s dead easy to get to from Kiev (to the extent that it’s just about doable as a day trip from the capital), it’s small and manageable, and the sights are impressive and worth seeing. Located approximately 140km north of Kiev, Chernihiv (also known as Chernigov) is an ancient city that dates back to 907 AD. But, it was during the period of Kievan Rus’ (Old Russia), circa 11th century, that Chernihiv was at the height of its power and wealth. 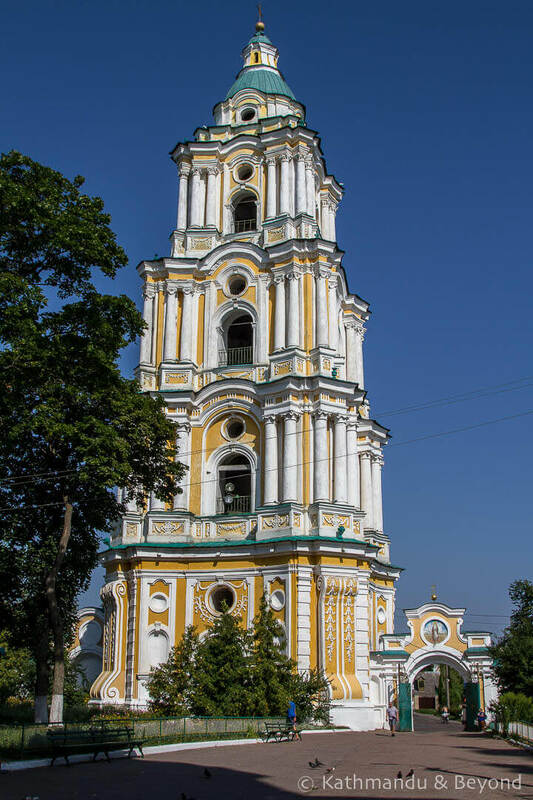 Indeed, a number of the city’s architectural gems were built during this time, including Saviour-Transfiguration Cathedral (see below), the oldest cathedral in Ukraine. 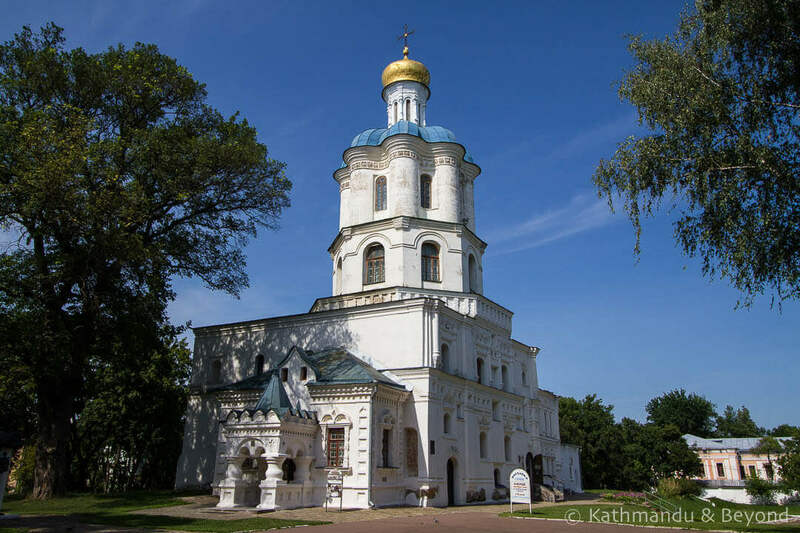 When it comes to overall splendour and impressiveness, Chernihiv is not in the same league as Kamyanets-Podilsky, but it is one of the most charming cities we have visited in Ukraine and is certainly worth a day or two of discovery. Plus, Chernihiv is the jumping off point for the fascinating purpose-built ‘21st-century city’ of Slavutych but more on that later. 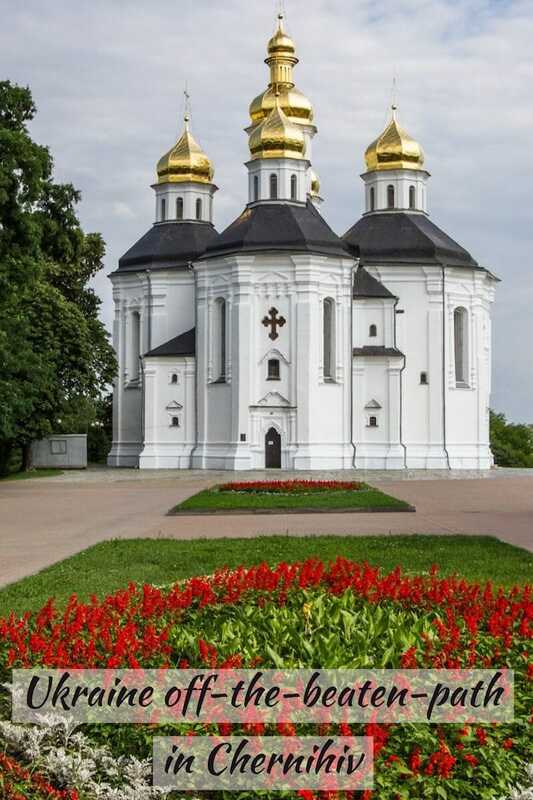 The primary reason to come to Chernihiv is to see its stately orthodox cathedrals and churches. Even if you’ve seen umpteen cathedrals and churches in Ukraine before, it’s difficult to not be impressed by these resplendent buildings. 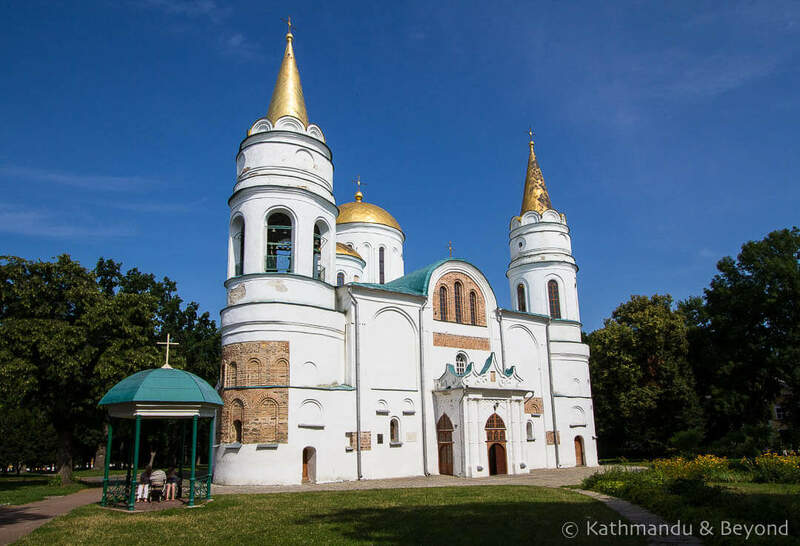 Dytynets, which translates as ‘fortress’ in old Russian, is more of a park than a citadel these days and within its confines, you will find three of Chernihiv’s most palatial religious buildings. 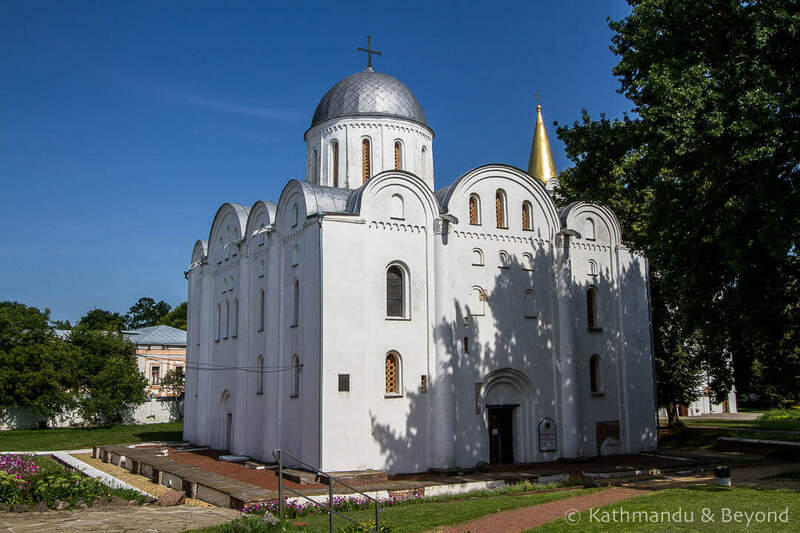 Situated in a row, next to each other, Chernihiv Collegium, Boryso-Hlibsky Cathedral and Saviour-Transfiguration Cathedral have been on UNESCO’s World Heritage tentative list under the collective term of ‘Ancient Chernihiv’ since 1989. 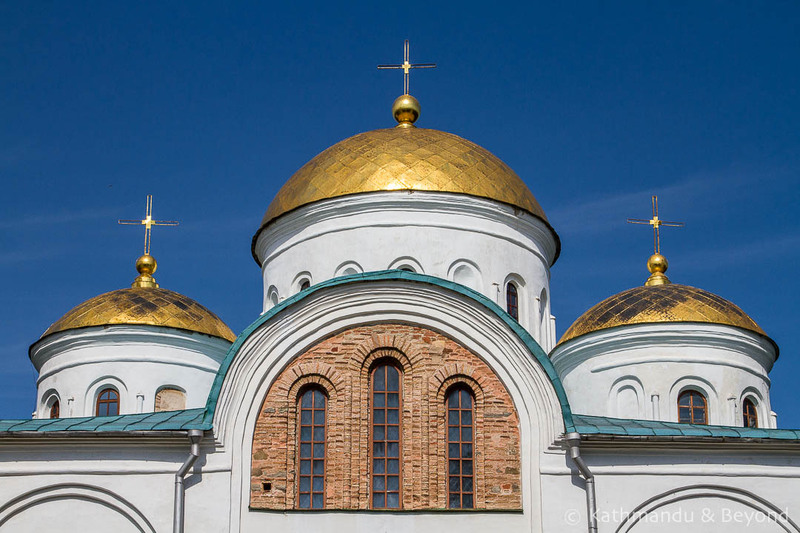 All three structures are worthy of exploration but, with its glorious golden domes, it’s Saviour-Transfiguration Cathedral that steals the show. Assuming the sun is shining, visit in the afternoon for the nicest light and best photographic opportunities. When you’ve had your fill of these three buildings, it’s worth wandering around the park and in particular taking in the view of the Desna River from the nearby ramparts before moving on. Over the road from Dytynets is the lovely St Catherine’s Church. From here, you can clearly see the bell tower of Trinity Monastery, about 2km to the southwest. Either take a trolley bus or walk there. 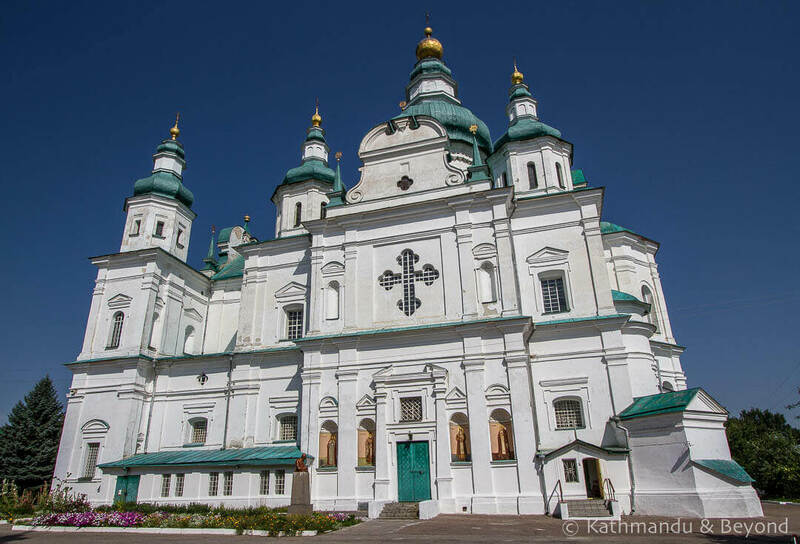 If you decide on the latter, you can do so via the Dormition Cathedral, which was modelled on the famous Kiev Pechersk Lavra monastery in Kiev, and the city’s imposing Glory Memorial (World War II memorial) (see below). As for Trinity Monastery, if the bell tower is open, it is worth climbing to the top for a great view down onto the building itself (afternoon is best for photography). The opening hours of the bell tower seem to be erratic, however. We went twice, once in the morning and once in the afternoon, on two separate days and on both occasions the tower was locked. If you aren’t too religious’d out by this point, it’s reasonably interesting to explore the St. Anthony Caves, a series of underground passageways, chapels and galleries that are a short walk from Trinity Monastery. 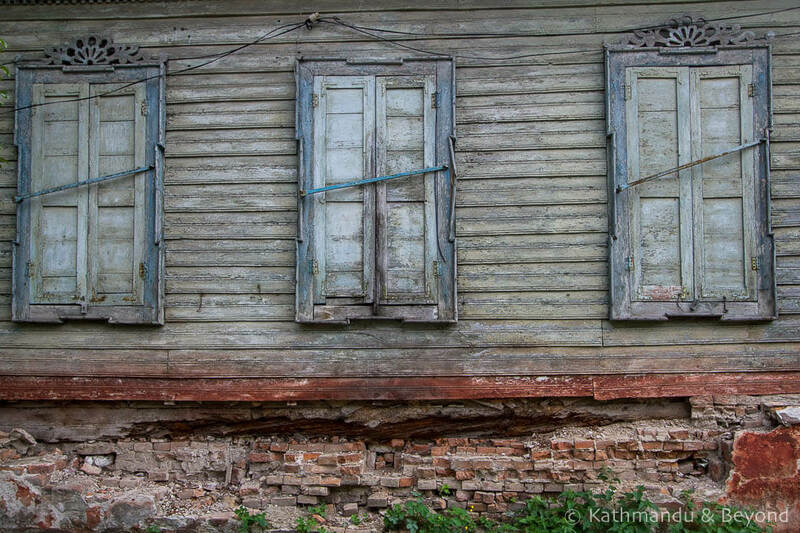 There’s a nominal entrance fee and once inside, you are free to wander at will. The corridors can be pretty confusing at times but they all seem to lead back to where you started so it’s difficult to get completely lost. It’s a good idea to carry a torch. 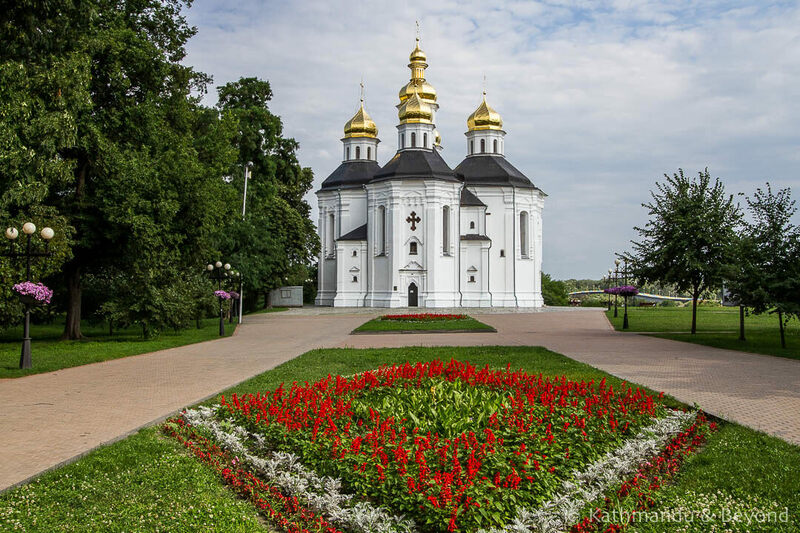 Away from the city’s spiritual buildings, there are other things to see and do in Chernihiv. Krasna Square is the city’s main plaza. It’s a big open space that is dominated by the Taras Shevchenko Regional Academic Music and Drama Theatre in its northeast corner. You’ll find other period buildings on and nearby the square also, along with some decent cafes and restaurants. 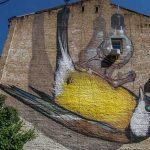 Apart from the Central Market, which was typically Ukrainian (bustling and chaotic), the rest of the places of interest that we found in the city were a little away from the town centre. Chernihiv Railway Station is a glorious building and if you are intending to visit Slavutych, you’ll need to make your way to the railway station in order to catch public transport there. The original station was destroyed by German bombs in 1941 and the orange-coloured building seen today was constructed in the late 1940s using the labour of German prisoners of war. The architect was Ukrainian born Gennady Granatkin, who was responsible for building a number of railway terminuses across the Soviet Union. He was also involved in the initial design for some of Kiev’s metro stations, including Arsenalna, the deepest metro station in the world. Chernihiv’s railway terminal is a magnificent example of Stalinist Empire style architecture and worth going to see even if you aren’t intending on using it or heading west to Slavutych. We walked to Trinity Monastery and spotted, and therefore decided to visit, the city’s huge Glory Memorial briefly mentioned above. Like so many monuments of its kind that we’ve seen in the former USSR, it’s a resplendent piece of architecture that was constructed to honour those who fell in World War Two/Great Patriotic War. An obelisk and eternal flame are situated atop a large grassy mound and at ground level there are a series of plinths displaying scenes of war and heroism. Rather fittingly, all hell was about to break loose when we arrived at the memorial but we managed to take a few, albeit rather dark, photos before having to scarper off and find some cover from the storm that descended upon us. The banks of the Desna River were also an interesting part of the city to discover. The architecturally-strange river port building is the best place to make an initial beeline for (you can clearly see it from the ramparts of the Dytynets). Once you’re done with admiring its unusual design, it is possible to walk along the riverbank until you reach the patriotically-painted bridge that crosses the river. If it’s a warm day, you’ll see plenty of people down here using the beach on the opposite bank, where they are swimming, tubing and generally having a good time. 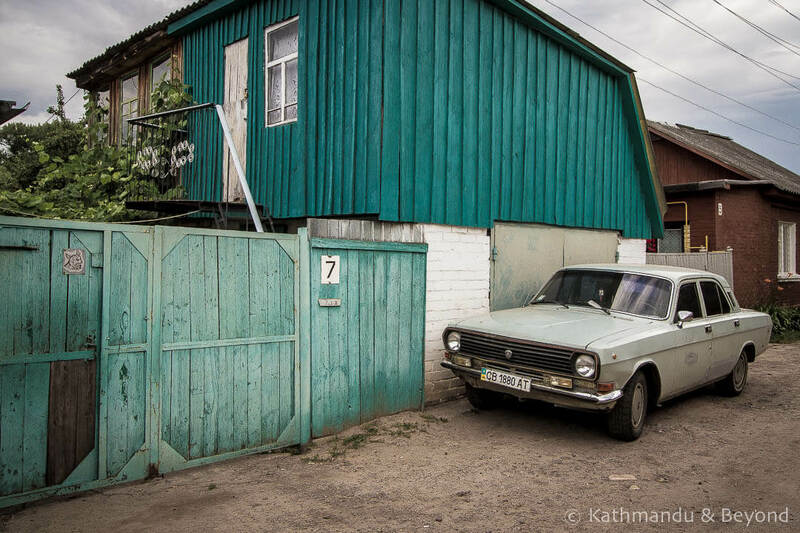 If you return in the direction of the river port building but inland rather than along the waterfront you’ll spot plenty of traditional wooden houses, some clapped-out old cars and generally witness a slice of provincial Ukraine. The only other place of note that we found in Chernihiv was the Wedding Palace. Officially called the Civil State Registration Department, I’ll admit it’s only worth locating if, like us, you have a fondness for concrete and Soviet-era architecture. It is located 1km northeast of Krasna Square. If you are interested in, or just like looking at, this style of architecture, you might want to check out our dedicated page on the subject. 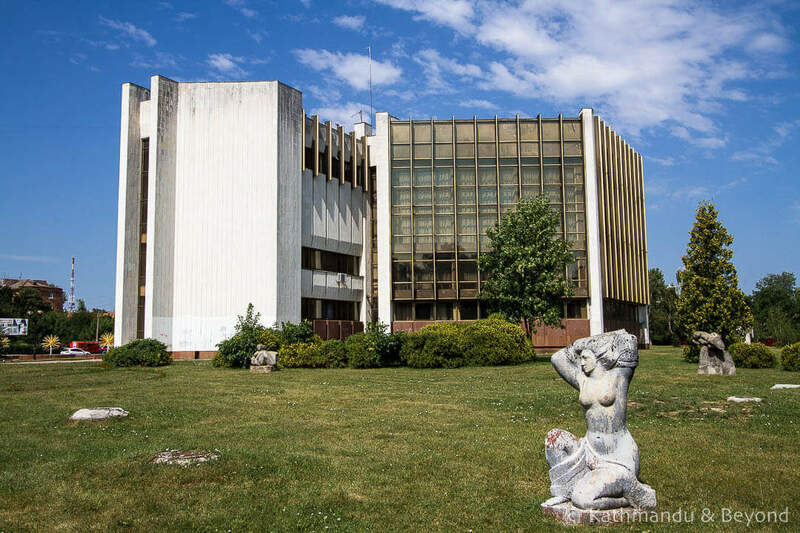 Architectonic is an ongoing project that documents the stark and, in our opinion, magnificent buildings and monuments found in Eastern Europe, the Balkans and the former USSR. We stayed in the excellent Myru Apartment in Chernihiv. Like so many of the apartment buildings in this part of the world, the outside of the block and the public entrance hall were totally grim but the interior of the apartment itself was spacious, well equipped and quiet. 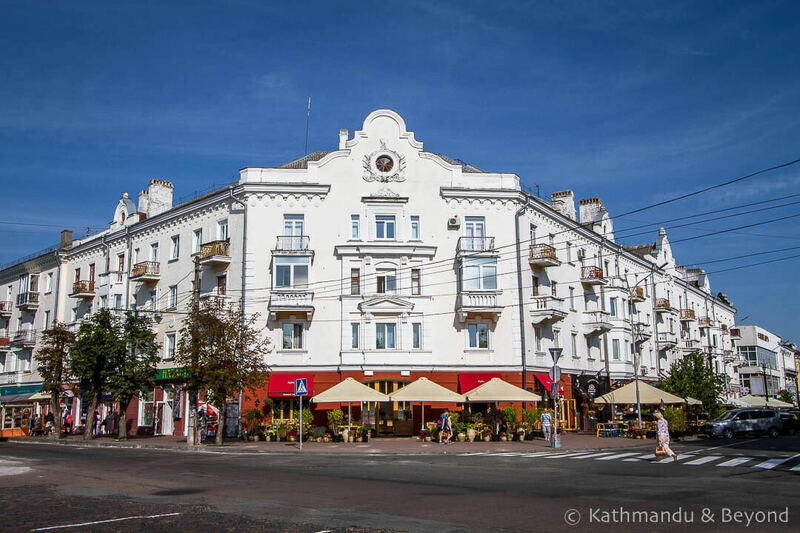 There was a semi-decent supermarket, as well as the central market, nearby and the location (a little up the road from the Hotel Ukraina) was convenient for transportation to/from Kiev. Search for other places to stay in Chernihiv. Chernihiv is best reached from Kiev. Regular marshrutkas (fixed-route minivans) depart from outside Kiev’s Lisova metro station. The journey time is around two hours and, upon arrival, you will be dropped off outside the Hotel Ukraina in the centre of the city. Going in the other direction, marshrutkas depart from the bus stop just around the corner from the Hotel Ukraina on Peremohy Avenue. There are also buses making the same journey: they charge the same and drop off and pick up from exactly the same locations as the marshrutkas in both cities. You only need to head to the bus station in Chernihiv (which is next to the train station) if you are going to Slavutych or trying to get to another destination without first returning to Kiev. 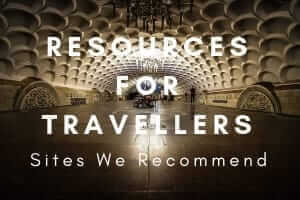 There must be transport to other places in Ukraine, for example east towards Kharkiv and destinations in between but, for us personally, finding out information was challenging. There isn’t much online (this website is sometimes helpful but is frustrating to use) and getting facts in person is difficult if you don’t speak Ukrainian or Russian. 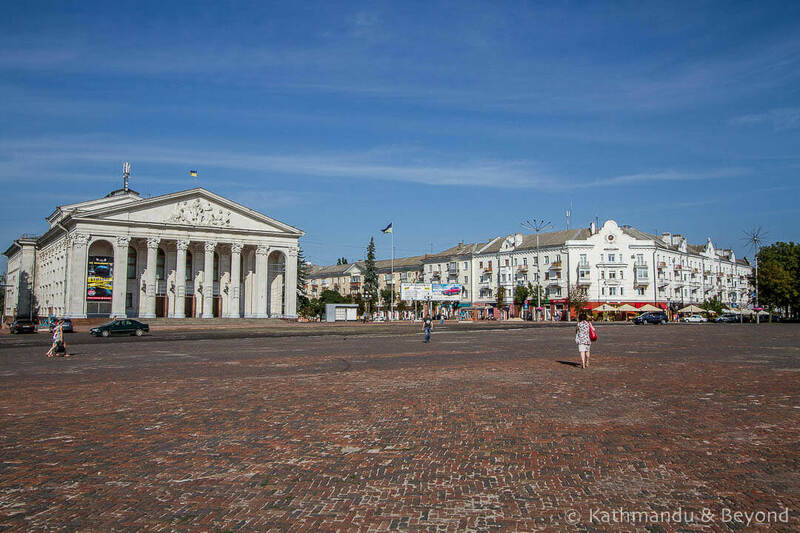 Our initial plan was to head somewhere rather than Kiev when we left Chernihiv but due to the problems cited above, we gave up on that idea and returned to the capital and found onward transport from there. 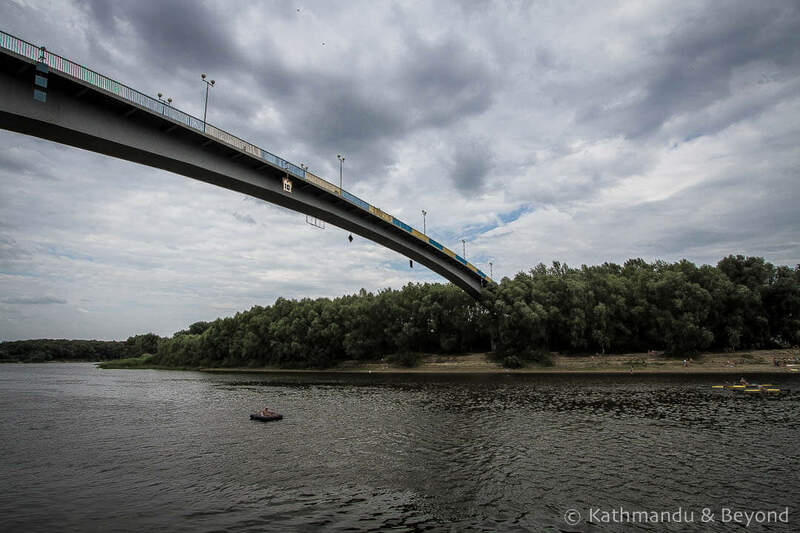 Chernihiv is most certainly worth visiting. 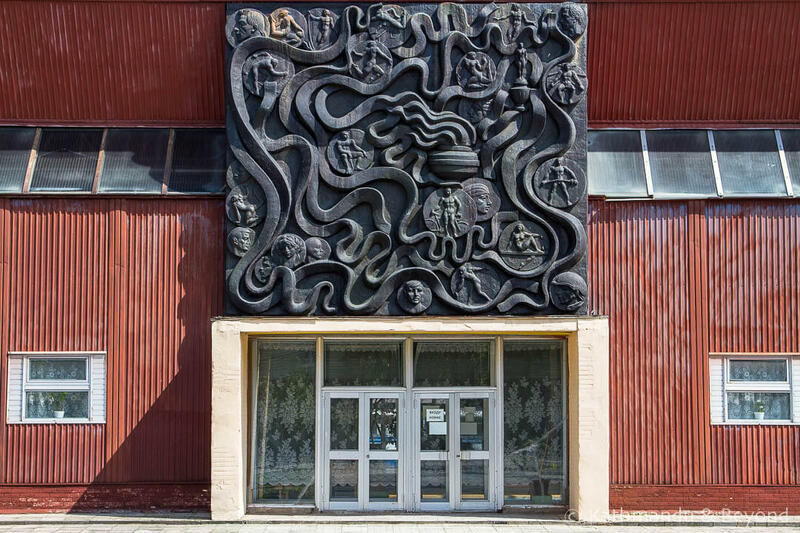 Even if you aren’t interested in seeing Slavutych, the city has enough of interest to warrant a trip in its own right. The cathedrals and churches are magnificent, the city is easy to navigate and the people are friendly (especially in the bar opposite McDonald’s!). As mentioned earlier, it’s possible to visit Chernihiv on a long day trip from Kiev but spending a night or two in the city is far more rewarding. What’s more, Kiev is expensive by Ukrainian standards and the prices drop significantly in provincial cities like Chernihiv. And finally, if your intention is to visit Slavutych, then it’s a lot easier to do so from Chernihiv than it is from Kiev. 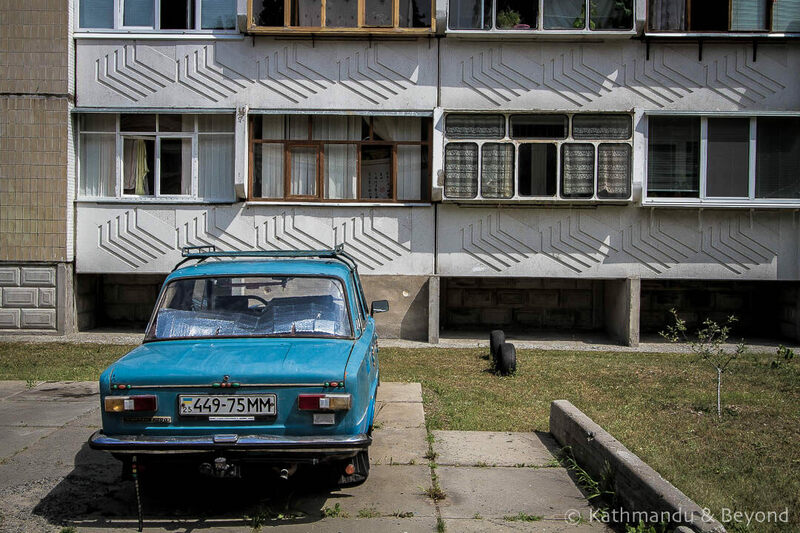 For those interested in Soviet-era architecture or a broader picture of the fallout from the Chernobyl disaster of 1986, Slavutych is a straightforward day trip from Chernihiv. 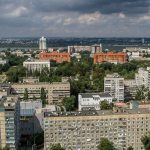 Located 40km west of Chernihiv, Slavutych is a purpose-built city that was created to house civilians evacuated from the towns and villages within the Chernobyl exclusion zone such as Pripyat. We have written in detail about our time in the city and so I won’t say much more about it here but what I will add is that visiting Slavutych is not going to be to everyone’s taste. Given that it was constructed straight after the disaster, it goes without saying that, unlike many Ukrainian cities, Slavutych does not have a pretty/historical part. There is little point in visiting if that is your interest but, if you are attracted to Soviet architecture (the city was designed and built by architects and workers from eight different countries of the former USSR) and/or have more than a passing interest in the Chernobyl disaster and its aftermath then you will find Slavutych an engrossing place to visit. 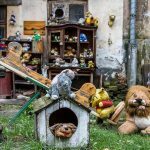 Click here for more details about our visit to Slavutych, including our thoughts on what it was like, how to get there on public transport and more besides.